Lent seems like a long time at the beginning, but it can pass you by quickly, if you don't make a point of putting forth the effort to pray more, attend more of the services, and to read more. One should set goals that are not overly ambitious, because often when we try to do too much, we end up doing very little. It is better to set realistic goals, try to stick with them, and hit the ground running. The Scriptures, especially the books of Genesis, Proverbs, Isaiah (which are read in the Lectionary Readings of Lent), the Psalter, and the Gospels: In the services of Lent and Holy Week the reading of these books are appointed to be read (almost all of Genesis, Proverbs, and Isaiah; the Psalter is read twice each week during Lent; and all four Gospels (read in their entirety during Holy Week). Most people probably would have a hard time reading them all, in a given Lent, but you could at least aim to read some of them. 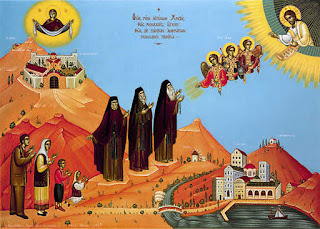 The Ladder of Divine Ascent, by St. John Climacus, which is appointed to be read during the Lenten services by the Typikon. The Lausiac History of St. Palladius (the lives of the Desert Fathers), which is also appointed to be read during the Lenten Services. The Conferences, by St. John Cassian. The Arena, by St. Ignatii (Brianchaninov). This is one of the best all around books on the spiritual life available in English, and is a text that is worth reading, and re-reading. The Life of St. Anthony the Great, by St. Athanasius the Great. Great Lent: Journey to Pascha, by Fr. Alexander Schmemann. A great guide to the meaning of the services of Great Lent. Psalm 118: A Commentary, by St. Theophan the Recluse. This Psalm is one of the most important of the Psalms, and it will be chanted at all of our funerals. We should try to learn the lessons of this Psalm while we still have time to apply them. Season of Repentance: Lenten Homilies of St. John of Kronstadt. 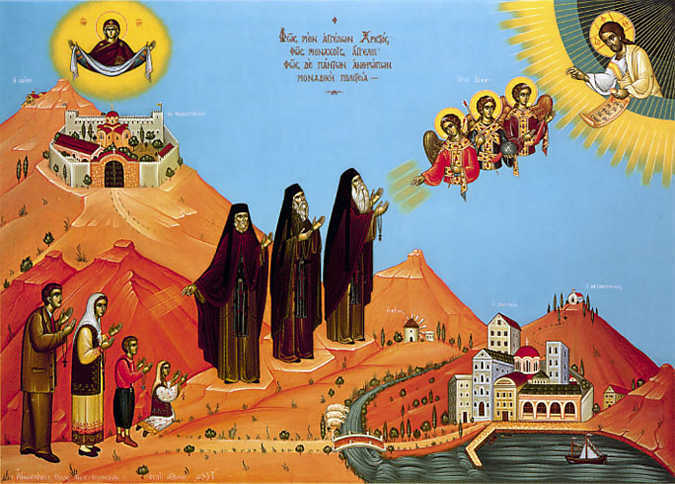 The Four Gospel, by Archbishop Averky. The Field: Cultivating Salvation, by St. Ignatii (Brianchaninov). This is by no means an exhaustive list, but if you are looking for something that will be edifying, you won't go wrong with any of them. Question: "Why do Orthodox Christians use leavened bread for the Eucharist?" The biggest reason, and the one that is the most indisputable, is that this is how we have always done it. Furthermore, when we read the accounts of the Mystical Supper (or "Last Supper"), there is nothing in the description itself to indicate that the meal was a Passover meal. And most importantly, the bread that is used in this meal is referred to in Greek simply as "artos" (ἄρτος), which refers to leavened bread; rather than "azymos" (ἄζυμος), which refers to unleavened bread. There are different possible explanations. One is that the Passover actually began the next day, on Holy Friday evening, following the day on which the Passover lambs were slain (Friday, during the day) -- both the type (the sacrificial lambs) and the antitype (Christ Himself, the Lamb of God). Dom Gregory Dix makes a very compelling case that this meal was actually not a Passover Meal, but a Chaburah Meal (see The Shape of the Liturgy, New Edition, New York: Continuum, 2005), p. 50ff). And interestingly, the "Agape Meal" we find in Jude 1:12, clearly has the Chaburah Meal as its background (Richard Bauckham, Word Biblical Commentary: Jude - 2 Peter, ol. 50 (Nashville, TN: Thomas Nelson, 1983), p. 84f). And so this meal is very likely what the Lord observed, perhaps on the eve of the day the lambs were sacrificed, which was the day prior to Passover itself, which began that evening (Friday evening). If this was a Passover meal, in some sense, it is also possible that the Lord simply broke with the usual patterns, and used leavened bread, though that seems to me a less likely explanation. "And the bread is leavened, because it is in a sense living on account of the leaven, and it is truly complete, for it witnesses that the human nature which the Word of God assumed was fully complete. He became flesh without being altered, and having assumed human nature, He has a rational and intellectual soul. And he is complete God and complete man, so that He might refashion me completely. And there are three ingredients in it, because of the three parts of the soul, and in honor of the Trinity: 1) wheat flour with leaven which represents the soul, 2) water which represents baptism, and 3) salt which signifies the mind and teaching of the Word. He said to His disciples, "You are the salt of the earth," that is, the teachers. And "Have salt in yourselves," representing knowledge and love at the same time, because He who is incarnate is one of the Trinity. 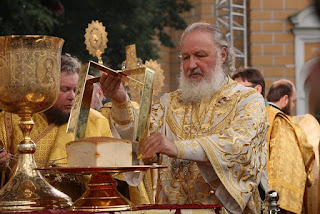 The bread is cooked in fire, because He, being God, was wholly united to us, and He gave us a share of His power and His energy; or rather all of Him was wholly united to our whole original state" (St. Symeon of Thessalonika: The Liturgical Commentaries, trans. Steven Hawkes-Teeples, (Toronto: Pontifical Institute of Mediaeval Studies, 2011), pp. 187-189). Leavened versus Unleavened Bread: What's the difference?